This week is a very special Saturday Soiree, it is a dinner party in the garden as suggested by the oh so talented Basil Becky. Please check out her delightful blog here. Together, we came up with this event to take advantage of the beauty that early fall in the garden provides. The menu is simple and perfect for a group of six, but can of course be modified for more. This event is intended to be started at dusk and continued on into the evening via candlelight. Enjoy! Cheese plate- see here for suggestions. Grilled Peach Salad- Recipe can be found here. Preheat oven to 400 degrees. Rinse asparagus and cut off tough ends, discard ends. Lay asparagus flat on a baking sheet lined with foil. Drizzle olive oil over spears and roll spears until all are coated. Sprinkle with minced garlic, kosher salt and pepper. Place pan in the oven and bake for 8-10 minutes, until lightly browned and tender when pierced with a fork. Drizzle with fresh lemon juice before serving. You can add a bit of lemon zest, if desired. Preheat oven to 425 degrees. Rinse chicken inside and out, discard excess fat, pinfeathers and pat inside dry. Place chicken in a large roasting pan. Liberally salt and pepper both sides of the chicken. Stuff the cavity with thyme, reserving enough thyme to use as a garnish, 1 lemon halved and 2 halves of garlic. Brush the outside of chicken with butter and sprinkle again with salt and pepper.Tie the legs together with string and tuck the wings under the body of the chicken. Cut the two remaining lemons into quarters and scatter the remaining lemon and garlic around pan. Lay bacon slices over chicken to cover. Roast chicken for one hour.Remove bacon slices and set aside. Continue roasting chicken for an additional 1/2 hour, or until juices run clear. Remove to a platter and cover. Remove all but two tablespoons of the fat from the bottom of the pan. Add the wine and the chicken stock and bring to a boil. Reduce heat and simmer for 5 minutes, or until reduced by half. Slice chicken on a platter. Garnish platter with bacon slices, roasted garlic, reserved thyme, and one lemon sliced. Use your surroundings as your guide. I like the mental picture of this party being thrown in a 100 year old barn tobacco barn only lit by flickering candlelight or maybe beside a softly babbling stream with abundant wildflowers. If you don't have either one of those things in your yard or if you have no yard at all, not to worry. This party is perfect for a porch or balcony as well. Right now, sunflowers are in bloom and groups of this cheerful flower make excellent centerpieces. I would use many tealights scattered about the table Textured white on white is perfect for linens. 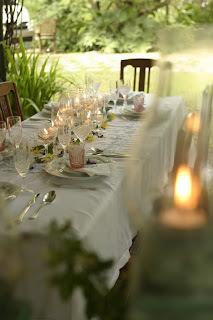 For example, I would use a white tablecloth with scalloped edges and white linen napkins. Rattan chargers and serving pieces would be a nice touch. 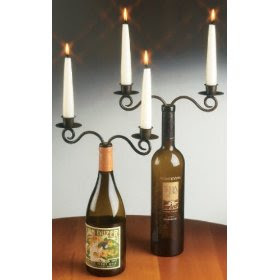 Two wine bottle candelabras would look lovely on the table and are inexpensive. I find that for an event such as this, there is no need for additional music, simply allow nature to be your soundtrack. Sparkling water, prosecco, perhaps a nice light pinot noir (I like Cloudline) for red drinkers and limoncello to offer a toast to the night. As usual, these three fabulous dresses can be found at edressme.com. Want more information? Just click on the image. I adore these dresses. The event would likely demand flats but aren't the shoes pictured amazing? Remember to check out Basil Becky's blog for gardening tips, recipes and entertaining stories. The beautiful garden images on the post are from Becky's garden and are only a small portion of the beauty that can be found at her site. Great suggestions and it was a pleasure to work with you! This entry was posted on 6:22 PM and is filed under dinner party ideas , Dinner party in the garden , dinner party styles . You can follow any responses to this entry through the RSS 2.0 feed. You can leave a response, or trackback from your own site. Lemon and Garlic Chicken added to the overall information quotient and the pics are just awesome! Would have loved to see more table settings. Yet another soiree that I would love to attend and I wouldn't mind doing so wearing that second little number! Thanks for allowing me to work with you! It was great fun. You are so talented, I love your blog! Dining on an elegant table outside.. I love the idea. I wish we did not have rain..
Wow what a fun event!! its gorgeous here today in the northeast so I'm thinking of setting up something beautiful outdoors near our old springhouse for dinner. I love the outfit choices you selected and the pic of the sunflowers is gorgeous. oh sounds like a perfect little party!! Looks like such a great party! Hope you had a great weekend! What a fabulous little idea. Love the settings. Lovely! I adore all of those dresses too..esp the first one! I would love to attend this event! EVERYTHING looks très FAB!!! I love the table! It looks perfect! I am now very hungry after reading this post! Also those dresses are gorgeous! I think the first one is my favorite, but it would be hard to choose! This definitely fits my idea of the perfect end-of-summer garden party...the food, sunflowers and setting would be beyond lovely. I'd also like to try out that roast chicken recipe. In my eyes, Ina can do no wrong. Her food always looks delicious and I love that she cooks to make her guests feel welcome --not to impress them. Happy to discover your blog! Thank you for your lovelvy comments on my blog! This soiree sounds wonderful!! Great advice on food! Thank you for all of your comments, it was great fun to pull together! Wishing all of you a wonderful day.